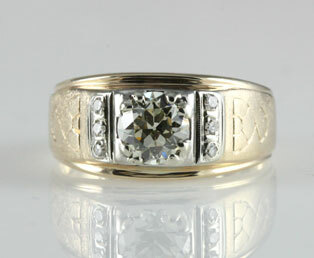 A radiant old European-cut diamond steals your attention in this gentleman's vintage wedding band. This slightly yellow, 1 carat center diamond, is framed by six accent diamonds that add extra sparkle to this wide gold band wedding ring. Interesting designs are engraved on the sides of this ring. This estate ring is created with a yellow gold band and a white gold mounting for all diamonds. A great ring for a man or a woman. Old European-cut diamonds were cut in the early 1900s. This diamond cut looks exceptional in candlelight and dim electric light. Old European-cut diamonds are known for their rounded girdle and high crown. This diamond cut is often confused with old mine cut diamonds.